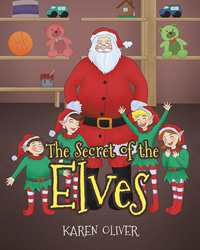 Recent release “The Secret of the Elves” from Page Publishing author Karen Oliver is a lovable tale of camaraderie and compassion as elves work together to save Christmas from being ruined. Karen Oliver, a lover of writing poetry and nursery rhymes, has completed her new book “The Secret of the Elves”: an enthralling tale about Christmas time that leaves a valuable lesson for children to always remember and keep at heart. “The elves were all busy, not even stopping to eat. Santa’s eyes did not twinkle; his boots hurt his feet. While piles upon piles of toys lay neglected. Published by New York City-based Page Publishing, Karen Oliver’s delightful story is told in a vivid style that emphasizes the character’s genuine emotions of thoughtfulness and care for jolly old Santa, as they come to his aid with the goal of saving Christmas. Readers who wish to experience this endearing work can purchase “The Secret of the Elves” at bookstores everywhere, or online at the Apple iTunes store, Amazon, Google Play, Kobo, or Barnes and Noble.